Two news items from the St Neots Advertiser affected the interests of St Neots rowing members, the first that the Ouse was navigable and twenty barges of timber were delivered to Messrs Tebbutts at Navigation Wharfe, and also an item which undoubtedly concerned them after rowing-that Paines Local John Bull Ale was for sale at 10d per gallon, whilst gin and whisky was 3s Od to 3s 6d per bottle! 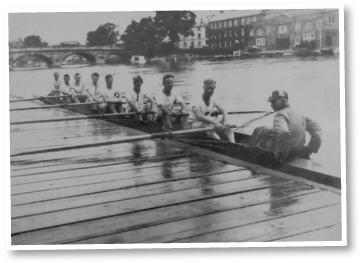 There was no Bank Holiday regatta but Rowing Club supporters, led by F. Beeson as Secretary, assisted in the organisation of an Aquatic Fete at Eaton Socon at which the usual rowing events were held with St Neots oarsmen competing. Profits were contributed to Eaton Socon Reading Room, but the press hoped that the event would lead to a resumption of the annual regatta. A regatta was held on August Bank Holiday after a break since 1882 and in welcoming the proposed event, the St Neots Advertiser commented that ‘it was like old times’ and hoped it would be as successful as in days gone by. The events were for gents’ and ladies’ singles and doubles, with also mixed doubles together with an event for out rigged doubles, no doubt a forerunner of modern racing craft. The gate realised £60 and the day was concluded with a display of illuminated boats on the river. The prizes awarded for this regatta ranged from £3 to £1 5s 6d for doubles and singles, with entry fees of 1s Od or 6d each. For local gents’ doubles, a cup and gold medals were given, with silver medals for runners-up. The races were over a 1/4-mile course in boats provided by the committee, whilst the day was concluded by a Pierrot concert, dancing to Raunds Band and ‘Living Pictures’ from the Picturedrome, Bedford. Following the Coronation celebrations in June, the regatta was held and included the usual rowing events together with swimming, canoe races, diving and water polo, with a concert by the Batley Male Voice Choir in the evening. An organisation known as the St Neots Attractions Committee, which included many Rowing Club members, arranged this and many subsequent regattas and town events. With gate receipts of £40, the regatta made a profit of 7s 1d. There was some doubt about the regatta because of previous poor entries, but it was held successfully, with 35 entries from London clubs and Trent R.C. competing with local oarsmen. Mr C. Gill presented the prizes, including a new silver cup for ladies’ singles given by Mr E. Hayward. At a meeting held in June with F. H. Fisher as Chairman, it was decided to discontinue the regatta until the cessation of hostilities. A special event known as the ‘Wounded Soldiers Regatta’ was held in July. It was organised by available Rowing Club members led by W. S. Wright and included single and double sculling with a special ‘Patients and Nurses’ double sculls event. Pleasure-type craft were loaned by local residents. Re-opening after World War I, it was decided to pay the debt owed to the club Syndicate of 1914. A special meeting was held in April at the Kings Head Hotel at which it was agreed to re-start the Annual Regatta. A further meeting in May elected a committee and officers. 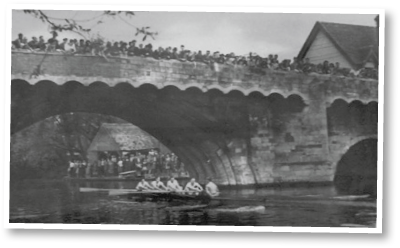 A complete report on this regatta is available from the St Neots Advertiser dated 8th August 1919; it points out that it was the first after the war and was a great success, with 55 races, before a packed grandstand and many pleasure boats on the river. The programme, in fine weather, lasted from noon to dusk on August Bank Holiday Monday and also included swimming, diving, pillow fights and decorated boats, with music by Raunds Silver Prize Band. 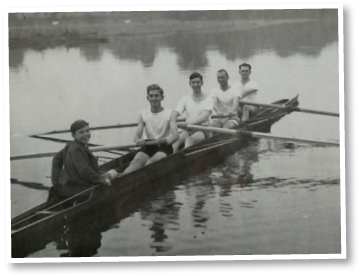 The rowing events included boys’, ladies’, gents’ and veterans’ singles, gents’ pairs and doubles and open fours. The Regatta was becoming re-established, with 53 events including swimming, sideshows and punt tug-of-wars in addition to rowing events. The shield presented by E. Hayward was awarded for local sculls for the first time. At the end of the year the club had a cash balance in hand of £4 3s 10d. A programme (price 3d) shows 63 races in events similar to 1919, again with swimming etc., the Biggleswade Silver Band, and dancing in the evening. The Town Cup, Hayward Shield and the Leney (County) Cup were listed as challenge awards for pairs, sculls and junior fours. The admission fee to the Regatta was 1s Od up to 5.30 p.m. and 6d for the evening commencing at 6 p.m. which included the finals of rowing events and graceful diving. The expenditure in 1922 was £98 13s 7d and the balance in hand was £11 2s Id. It was reported in the St Neots Advertiser that owing to a large programme, the last race was held in the dark at 9.30 p.m. The club Annual Dinner was held at the Cross Keys Hotel- tickets 3s 6d each. A photograph of a display shows a fine total of 59 trophies and individual prizes won this year. The usual Bank Holiday Regatta was held and organisers includes many well-known business and private personages of that time. The club balance of cash in hand was 5s Od. A set of clubhouse rules was inaugurated. mateur Rowing Association, but a request for £2 for an Olympic Fund was not agreed as the club was in debt. Mr F. H. Fisher collected for regatta funds from the numerous river craft, which always attended. He used a small single canoe with a collecting box on a long pole and raised valuable funds by this means for many years. A programme of racing events restricted to club members was held along the meadow from what were known as Bottom Boardings to Top Boardings; the bathing shed was used for changing and events were fours, pairs and handicap sculls. This-regatta was held in a daylong downpour of rain, 53 events being completed between 12.30 and 8.30 p.m.
Mr E. Cousins, who had been Treasurer of the Regatta Committee for some years, was re-elected and reported a balance of £7 5s 7d. An event for open senior eight’s was inaugurated. It was reported that 2,000 persons paid 6d for admission. During this period, covered and open grandstands were provided for spectators, the sum of £34 8s Od being paid for admission to these and the Regatta Field in this year. In view of very small entries, a decision to continue the Regatta was only made after a long discussion. A balance of £2 18s 21/2d in regatta funds was reported. This year the engagement of a Silver Band was discontinued and replaced by a ‘Marconiphone Electric Orchestra’ with loud speakers provided by C. E. Moore and Company. The St Neots Advertiser reported that the Regatta was ‘full value for money’, with St Neots club winning five events including eight’s, senior fours and sculls. At an Annual Dinner, Mr C. G. Evans was presented with a chiming clock by G. Harvey. 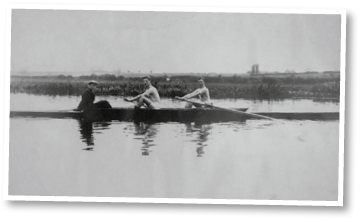 Mr Evans was referred to as ‘Father of St Neots Rowing Club’ and it was stated that he and his two sons were the mainstays of the club. Forty-four races took place, at this year’s regatta, with entries from London, Norwich and local clubs. The St Neots Quadruplets were born this year, an event that attracted nation-wide publicity. This would not normally become connected with a rowing club, but some St Neots club members will remember this as the quadruplets’ father, Walter Miles, was a friend of the club and regularly drove the large lorry hired from Messrs Rowlatt Brothers to transport club boats to regattas, in particular the eight to the London Tideway Head of River Race. Also, Michael, one of the quads, was coxswain to a very successful four in the early 195Os, and it was very interesting to observe the sudden interest taken by lady mayoresses when learning his identity whilst presenting prizes. A joint club and regatta committee dinner was held at the Bridge Hotel in October, whilst a public appeal by President Rev. South Phillips raised £84 for the purchase of boats. It was decided to continue to hold the Regatta on Bank Holiday Monday and also to specify best boats for the senior sculls. Twelve clubs from East Anglia and London competed at the Regatta. St Neots won six events although C. L. Evans lost in the senior sculls final to Horwood of London who was an English International. The programme included a diving exhibition and canoeing, and finished with a dance in the Public Rooms. The club was negotiating with the National Fitness Scheme for a grant of £35 towards the purchase of two clinker fours, which were obtained by the club using funds raised by the Ripples Dance Band. A programme of this year’s Regatta shows 9 events with 67 entries and 60 races taking place over 7 hours. The crews were identified by Red Flag-Bedfordshire side, and White Flag-Huntingdonshire side. At a meeting on 2nd October, it was agreed that the new skiffs and blades be packed away for the winter months on 16th October. At the Annual Meeting, the Regatta Committee had 10s Od in hand after lending £25 to the Rowing Club. A regatta dance was held in the Public Rooms with the Ripples Dance Band, admission 2s 6d. World War II. The club was closed and the boats, oars and other equipment were left stored. This committee commenced arrangements for a regatta but it was not held. The next regatta was in 1946. Club re-opened after the war by a small number of pre-war members. It was discovered that some of the equipment stored away in 1939 had disappeared, including a large amount of timber which had been used every year to form a grandstand at regattas in the 193Os. St Neots was the only regatta to be held in the Midlands. It was under N.A.R.A. Rules and included decorated boats, a keep-fit display, comic events and a dance. The organisation of the Regatta was transferred to the Rowing Club. The profit this year was £58 4s 03/4d. It was decided to change the Annual Regatta from August Bank Holiday Monday to the preceding Saturday, which was successful as a large crowd attended. The club had a cash balance of £170 2s 5d in hand. A club flag was presented by Messrs H. and L. Evans. The club was asked to organise the Annual N.A.R.A. Championship Fours Regatta at St Neots. This was agreed and the St Neots Chamber of Commerce was asked to arrange supporting events in the town. This was the start of Carnival Week, which is still being held each year. The Annual Regatta was continued on the August Bank Holiday Saturday and was again successful, it being estimated that 1,184 people paid for admission, whilst a prize draw was held with a gents’ suit or ladies’ costume of value £15 as prizes. The N.A.R.A. Championship Regatta was held in September. A shell four was purchased from the Olympic Games Committee for £140. The boat was named ‘Carnival Queen’ by the St Neots Carnival Queen in a ceremony on the Market Square at Easter. At the Annual Dinner, the club President made a call for new members.